A diverse range of communities and industries rely on access to the Murray-Darling Basin’s water resources. Basin state governments are working together to ensure a balance is achieved between the water needs of communities, industries and the environment in order to maintain a healthy river system. As there is a limit on the amount of water used for consumptive (communities and industries) use, water is distributed among users through water entitlements managed by the states. Water entitlements give those the right to use water from the Basin, and can vary depending on where and how water is taken, and what it is then used for. Water allocations refer to the actual amount of water available to those entitlement holders throughout a water year (1 July – 30 June). Basin state governments determine the amount of water that can be allocated based on the total amount of water available within the Basin. This is done by determining how the availability of water may be affected over the year due to variability in rainfall and weather conditions, changes to inflows into storages and how water in storages, like dams and weirs, is managed. This gives water users certainty around how much water they will be able to access over the year, and helps states manage water availability through varying and unpredictable climatic conditions. At the start of each water year, states make water allocation announcements based on their water availability predictions. However, the amount of water available in the Murray–Darling Basin system can vary throughout the year, so it is important allocations are reviewed regularly. If water availability improves, user allocations can be increased. 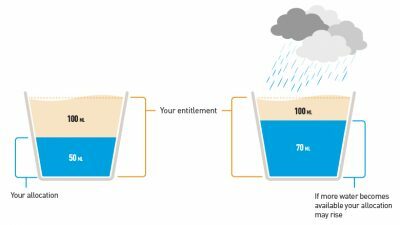 For example, if a user has a water entitlement of 100ML of water and are only allocated 50% of their share, they are able to use 50ML of water. If more water becomes available over the year than expected, their allocation may rise so they have access to 70% of their share, which would mean they can use 70ML of water over the year. By allocating water conservatively at the beginning of the water year, Basin state governments are able to ensure water security for water users while maintaining a healthy river system. If you would like more information on water allocation in your region, please contact your state water manager.